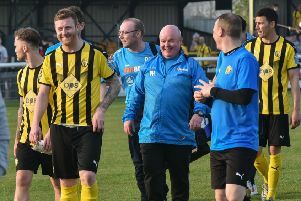 Leamington boss Paul Holleran says successive wins over Chester FC and Alfreton Town completed his best four days in charge of the club. A hard-fought 1-0 victory over title-chasing Chester on Saturday was followed up by a 2-1 win at Alfreton on Tuesday evening to give Brakes their first ever three-game winning streak in the Conference North. And, having seen his side rise to tenth inthe table, Holleran was in a mood to celebrate. “I can’t think of a better four days,” he said. “It’s the hardest six points we’ve earned. “There’s some battered bodies, the players were tired and weary when they travelled home on Tuesday night. Holleran was particularly impressed with the way his side were able to go again after their memorable victory against Chester, refusing to get intimidated by a physical Alfreton side while producing the game’s few moments of quality. “Some people claimed it was a smash and grab job but they had three shots on goal and we had three shots on goal. “We showed big hearts and commitment and we knew the pick up of the second ball was going to be important. “We knew we’d lose a lot of the first contests so to get our starting positions right was massively important. “It was a great ball in for the set play and a brave header from Jack Edwards and there wasn’t a lot of quality in the game but the second goal was quick, sharp and decisive. Brakes will now look to transfer their fine league form to cup competition, with Witton Albion the visitors to the Phillips 66 tomorrow in the FA Trophy. The Northern Premier League side currently sit on the fringes of the relegation zone but come into the game on the back of a thumping win over Buxton at the weekend. They also picked up a couple of notable scalps in the FA Cup earlier in the season and, following on from Leamington’s exit at the hands of lower-ranked Stourbridge, Holleran has every reason to be wary. “They’ve done really well after coming up last year and are a good footballing side. “Carl Macauley likes his sides to play football and they’ve already accounted for FC United and Spennymoor in cup competitions this year and they are coming in on the back of a good result on Saturday. “It will be a tough game but when you are in the third round of the Trophy they are all good non-League sides.